A non-mirrored volume resource is a DataKeeper resource where no data is replicated to any node in the cluster. This resource type should only be used where the data is temporary and/or non-critical such as MS SQL Server tempdb space. In this case, when MS SQL restarts on another node after a failover or switchover, the tempdb space is automatically recreated so replication of the data is not necessary. This non-mirrored volume resource will be able to come Online and go Offline on all cluster node without ever affecting the configured volume. Additionally, the volume will remain unlocked and writable at all times on all nodes in the cluster. Configure a volume on all cluster nodes using the same drive letter (all nodes must use the same drive letter). Create any directories that are required for the volume on all cluster nodes. • In the Failover Cluster Manager, right-click the Cluster Group or the Role that will contain the non-mirrored DataKeeper Volume Resource. • Select Add a Resource, More Resources, then select DataKeeper Volume. 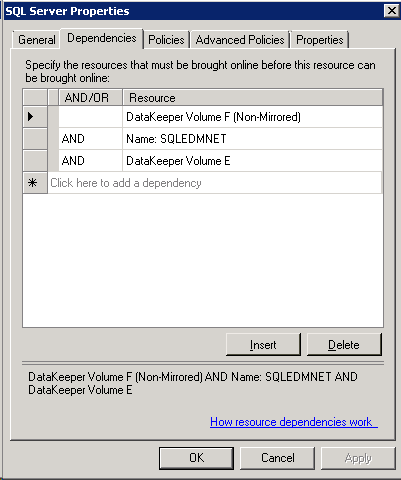 • Right-click on the new DataKeeper volume resource and select Properties. • Enter the Resource Name you selected earlier (Example: “DataKeeper Volume F (Non-Mirrored)”) then click OK. You do not need to change any other properties at this time. Ensure that the volume security settings for the user account that is chosen to run SQL Server services has full access to the volume on all nodes in the cluster. Ensure that the “SQL Server” resource in the Failover Clustering group has a dependency on the new DataKeeper Volume resource.